LAKELAND, Fla. (AP) This was a welcome sight for Tigers fans: Miguel Cabrera, looking healthy again, hitting a towering home run. Cabrera connected for his first homer of the spring in Detroit's 7-4 win over Atlanta on Saturday. It was the first time he'd gone deep in any game for the Tigers since April 28. His 2018 season ended after 38 games because of a biceps injury . "He's feeling good. He's having a good time," manager Ron Gardenhire said. "He's actually been swinging good. We've seen him hit them all over the place in BP. It's all about timing. Been off a long, long time." Cabrera seems comfortable at the plate so far: He's 6 for 11 with a home run, a double and three walks in five spring training games. Cabrera singled and walked before hitting a two-run homer to right-center field off Jacob Webb in the fifth inning. 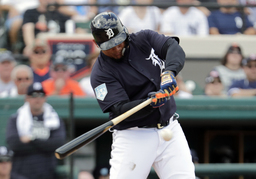 "I think the wind got it," the Detroit slugger said, showing perhaps more modesty than necessary. Cabrera hit three home runs in April last year - and that was his total for the season. He missed almost all of May after straining a hamstring, and he went homerless in 41 June at-bats before his season ended for good. Cabrera turns 36 in April and has hit only 19 homers in 168 games over the past two seasons. The rebuilding Tigers have traded plenty of stars away over the past couple years, but Cabrera's huge contract makes that difficult. Cabrera did hit 38 home runs in 158 games in 2016. He's just 35 homers away from 500, and a run at that milestone would be a highlight even if the Tigers don't contend for a playoff spot in the near future. "He won't have to work as hard as a lot of other guys for timing. He's just a good hitter," Gardenhire said. "You saw him take some real close pitches and foul off some pitches, and then barrel it up too."